In the US, Fourth of July means a picnic or cookout. You probably have your own favorite menu. Mine includes grilled or barbecued meat (often served on buns, in the form of hot dogs or hamburgers), sides of potato salad and coleslaw, and a yummy dessert. To drink? Well, most cookouts feature cold beer. But this year I’m serving something different: the Betsy Ross Cocktail. Seems appropriate, don’t you think? It’s an obscure drink, but tasty. It’s also easy to make (none of the ingredients are obscure!) — and even easier to drink. All in all, it’s a bang-up cocktail. Perfect for July 4th fireworks. No one seems to know how this cocktail got its name, or when it was invented. I first learned about it from Gary Regan’s The Joy of Mixology. As far as I know, the recipe first appeared in print in 1941, in Grosby Gaige’s Cocktail Guide and Ladies’ Companion (they don’t write book titles like that anymore). But who cares where this cocktail came from? It’s flavor we’re after, and the Betsy Ross delivers. It’s a great combination of cognac (or brandy) and port wine, with some orange liqueur thrown into the mix to liven things up. Combine ingredients in a mixing glass filled with ice. Stir vigorously until the drink is cold. Strain into a cocktail glass (preferably chilled), and serve. No garnish needed (or wanted) for this drink. You should stir, rather than shake, this drink to keep it clear (shaking creates bubbles, which can make drinks cloudy). 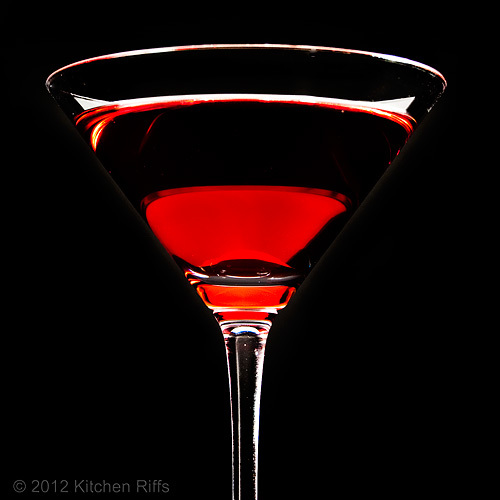 For more info on when to stir and when to shake, see Cocktail Basics. 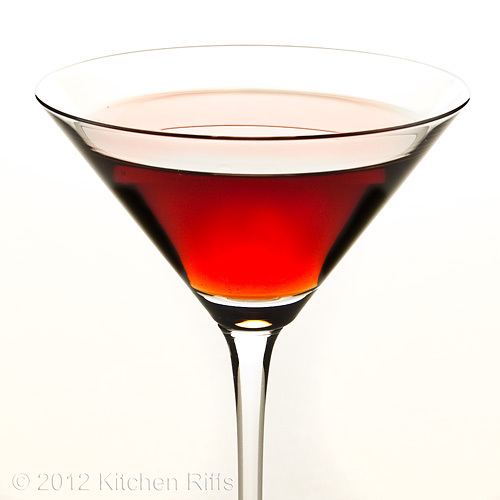 The Betsy Ross is one of the few cocktails to contain port — a fortified wine. Vintage ports can be expensive, but you don’t need one of those for this drink. 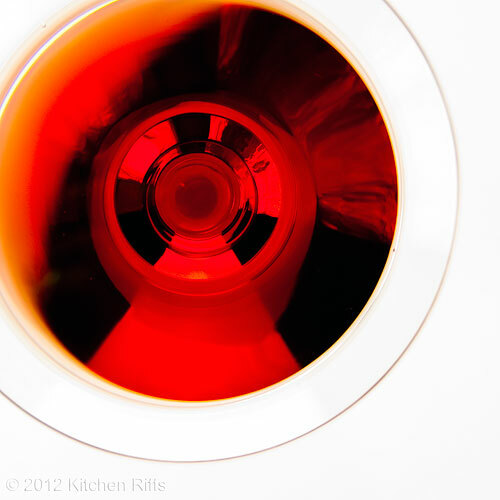 You want a ruby port, which is inexpensive (and always drunk young). A good supermarket brand, like Taylor’s Port — the (New York State Taylor’s, not the Taylor’s from Portugal) — works fine. Although port is fortified (it contains 18% alcohol), it will oxidize after opening. Not right away (it’ll take several weeks), but eventually the flavor will go off. To prevent that, merely refrigerate it. It will still oxidize, but the process will take much longer (as in months). What to do with leftover port? You could just drink it - it's good by the glass. 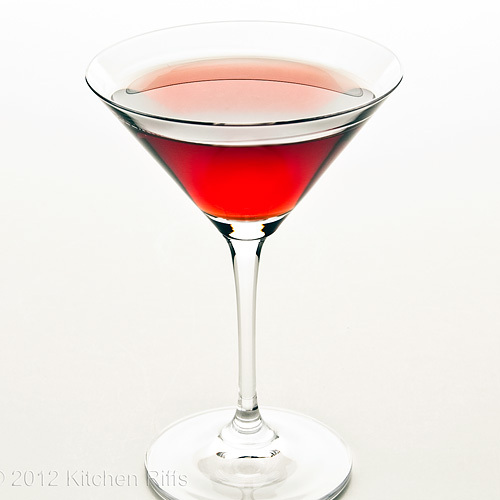 Or you might try a Port Wine Sangaree: Add 4 ounces ruby port and a teaspoon of simple syrup to an old-fashioned glass. Stir to dissolve the simple syrup, garnish with a lemon wheel or two and a dusting of freshly grated nutmeg. Some people float ½ ounce or so of brandy on top. Port is also great for cooking. Use it instead of wine or stock to make little pan gravies. Or you can make a terrific sauce with it. Paula Wolfert, in The Cooking of Southwest France, has a wonderful recipe for Duck Breasts with Port Wine Sauce. Another recipe that looks good — and is available online — is Stuffed Macadamia Chicken with Sage and Port Cream Sauce by Maureen over at The Orgasmic Chef. I haven’t tried this yet (it’s on my list!) but it looks great. Bottom line: Using up leftover port should be no problem. Me? I think I’ll have another Betsy Ross. But be careful: If you have too many of these, you’ll be seeing stars and stripes! Was Your First Grade Teacher Wrong? Speaking of stars and stripes, we all know that Betsy Ross is famous for designing and sewing the first American flag. Legend says she did so at the request of George Washington. But no one knows whether that story is actually true. She was never publically credited until 1870, when her grandson, William Canby, made the claim in an address to the Historical Society of Pennsylvania. We do know that Betsy Ross was an upholsterer during the Revolutionary War. At that time, upholsterers didn’t just finish furniture, they did all kinds of sewing — including flag making. And there’s good evidence that Ross did indeed make flags during this period. But the first US flag? Well, maybe — or maybe not. The USHistory.org has a whole page on Betsy Ross and her history including analysis and point/counterpoint. My position? Well, I learned as a schoolchild that Betsy Ross sewed the first US flag. And who am I to argue with my first grade teacher? At least we know for sure that July 4th is the official Independence Day of the US — Wikipedia says so, right? I just hope my first grade teacher isn’t reading this. I was in Betsy Ross's house not to long ago. I wonder if she served this to General Washington when he came calling. In any case, I am very fond of port so I just might have to give this a try. Hi This is How I Cook, who knows? The origins of this cocktail are a mystery (at least to me). If you like port, you'll love this - it has super flavor. Thanks for commenting. It's interesting to see the different effects with the different coloured backgrounds. The lighter background sells the drink to me. Hi, thank you for this post, it did refresh my memory and I even learned a few facts (if they are facts indeed) :)I also like your drinks and especially photography. Have a grand Fourth of July! Hi Suzanne, it's always fun to shoot the same subject using different angles, backgrounds, etc. The same subject - with identical light - can be made to look quite different (sometimes a good thing, sometimes not). Thanks for your comment. Hi Marina, history is lots of fun - so much we think we know, we don't know completely (because there are certain aspects we've never thought about, or didn't know in the first place). Thanks for your kinds words and comment, and I hope you have a great 4th too! Hi CCU, that overhead view is my favorite, too! Thanks for the kind words, and the comment. Hi Tania, it's quite good! And I agree it's pretty. I'm looking forward to serving them tomorrow. Thanks for your comment. Good old Betsy!! I'll try one of these this afternoon since it's already the 4th here. I'll toast to you and to every other American ex-pat who's away from home for the holidays. Another wonderful drink, if anyone ever inquires about beverages, I will be sure to send them your way. Hi Maureen, I hope you'll enjoy it! Happy 4th. I'll toast you tomorrow with one of these. Thanks for commenting. Hi Alessandra, thanks for that, and your comment! Happy Fourth of July and again what a stunning photo! Hi Raymund, thanks so much. Hi Jenny, it's OK not to understand it, just have a swell time celebrating! It's a good cocktail - worth a try whenever you have some port on hand. Thanks for your comment. Hi Cathleen, thanks so much for your comment. Yes, you do have to wonder about the accuracy of what we learned in grade school or any grade for that matter! July 2- close enough right? :) Your bar must be well stocked to have all of the ingredients for all of these drinks! I mean how many people have bitters, and more than one type of bitter! :) I have the ruby port and the cognac. :) Another great looking drink! Have a great 4th! Hi MJ, my bar actually has gotten pretty well stocked over the years, as I buy new bottles to try new drinks. But so many drinks require bitters - they're to many cocktails what salt and pepper are to many recipes - that I always have bitters on hand. Happy 4th to you, and thanks for your comment. You know what I need, your alcohol collection in my house. Oh! of course, you too! These questions did not come up in my US Citizenship exam and I think it should have been included. Hi Carolyn, it is a rather nice looking drink, isn't it? ;-) Thanks for your comment. Hi Pencil Kitchen, I don't know how it happened, but all of a sudden we do have a fairly considerable liquor collection! Fortunately, it does take us awhile to go through a bottle, otherwise we'd be in trouble. Thanks for your comment. Hi Ilke, those are questions most of us born here couldn't answer accurately - they're glossed over in history lessons. And it is a pretty fancy drink, but totally delicious. Thanks for your comment. Hi Nami, I like playing with my food when I photograph it! Always fun to experiment and see how different backgrounds, lighting makes things look. Thanks for your kind words, and your comment. You can submit your betsy ross cocktail pics on http://www.foodporn.net It is a food (and drink of course) photography site where members can submit all food (and drink of course (again) LOL ) pictures that make readers hungry. Wish I had one of these cocktails to accompany my fireworks gazing last night. Hope you had a wonderful 4th. Thanks for the history lesson. I guess the dates are close enough ;) Love all the background information on your posts. Thanks for all your kind comments on my travel posts. Sorry I haven't been around too much lately. Hopefully things will settle down soon and I can get back to my usual routine. Hi Biren, I had a great 4th; sounds as if you did the same. I'm enjoying your travel posts quite a bit - sounds like you had a wonderful time. Thanks for your comment. drooooooooling drink of yours...sounds very interesting..
Hi Jay, this is indeed a drool-worthy drink. Thanks for your comment. Hi Rosa, port is great, isn't it? My impression is not many US cooks use port that often - we're missing out. I don't always have port in my refrigerator, but that should change - as you say, there are so many great ways one can use it. Thanks for your comment. I once posted a recipe for Betsy Ross Pound Cake if only I could remember when, lol...I better find it and add this link but first, I had better "test" this drink for goodness:) It may take a few tasting you understand:) I mean someone has to. It may as well be me!!! P.S. It was Flag Day Recipes and I've added your link! Hi Louise, never heard of Betsy Ross Pound Cake, but I'll have to try it (and thanks for adding my link to your Flag Day Recipes post!). Be careful when "testing" this cocktail, though - in all this heat, these are actually a pretty strong drink! Thanks for your comment. Hi Marta, I like that spirit! ;-) Thanks for commenting. Such a cool drink. And as usual your photos are beyond stunning. Hope you had a good 4th and enjoy your holiday weekend. I feel like I am reading lines from a James bond movie. "this cocktail should be stirred- not shaken..." Great cocktail. I wish you lived closer so that you could teach me some of your camera techniques. Your photos are always so stunning. ;-) Even if we witnessed it, there's always the possibility we didn't see everything! Hi Kim, it's a really fun drink. I did indeed have a nice 4th, and hope you did also. Thanks for your kind words, and for taking time to comment. Hi bam, lol! Thanks for your kind words. The photos are the result of lots and lots of practice. There are web-based courses out there if you're interested - the Perfect Picture School of Photography (http://www.ppsop.net/) has some that are worthwhile, though a bit pricey - but with most food photography the general rule is keep the light somewhat behind (10 - 11 o'clock or 1 - 2 o'clock) and use a big piece of white cardboard in front to reflect the light onto the dark (front) part of the photo. (With cocktails you have reflections to worry about, so the rules change somewhat.) Thanks for taking time to comment. That last shot is amazing!! Just gorgeous. I'm inspired every time I visit! Hi Kristy, that's my favorite shot too. Thanks for your kind words, and your comment.